Fourteen hundred years ago the Holy Quran said in Surah no 2 verse no 154 "And do not say of those who are slain in the way of Allah that they are dead. Instead, they are alive, but you do not perceive." And in Surah no 3 verse no 169 "And think not of those, who are slain in the way of Allah, as dead, rather, they are alive with their lord, well provided." 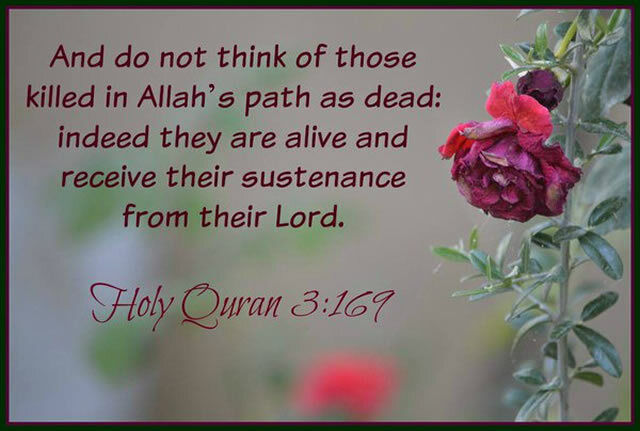 The meaning of these verses is that those Muslims who are slain in the way of God are not dead, but they are alive with their lord, and well provided, and we cannot perceive that how they are alive and how the God provides them the spiritual foods and drinks? There is a wonderful prophecy and true pretension of Holy Quran when I researched in 2009 according to the above verses, I found that there are certainly millions fresh dead bodies without any chemical of those Muslim Martyrs who were slain in the way of God (the way of religion Islam) in their graves under the Earth in Muslim cemeteries of the world since centuries and years. They are in fresh and sleeping condition without eating the food, drinking the water, without used any machine for their protection and without used any chemical on their dead bodies. I have described some true events of them in videos and eyewitness evidences where you can study about them shortly. This is not a magic, magical trick or sorcery that any body can reject or refuse what I have said about my research. It is a reality and a miracle. There is not even a single dead body in fresh condition with fresh blood of any Non-Muslim soldiers from Hindus, Jews, Christians and any other religions who were murdered during fight against the Muslims in the wars happened between the Muslims and Non-Muslims. So I request to Muslim and Non-Muslim scientists, Medical Doctors, expert religious scholars, saints and leaders that they research about it and point out the reason for the difference between the Muslim and Non-Muslim dead bodies. Our scientists have a lot of brain that they have made the bombs, and other modern technologies and they reached to the moon too. So I hope that they will find the reason of fresh dead bodies of Muslims under the Earth without chemicals too?